On the 12th of October 2016 grandmaster Ma Jiangbao passed away in Rotterdam (NL). His death is a great loss, not only for the Wu style but for taiji worldwide. Meanly in Europe this message hits us badly, because he actively taught here since 1986 and as a consequence a large group of students are left alone. Ma Jiangbao was the son of Wu Yinghua and Ma Yueliang, both considered to be taiji-legends already during their lives in China and abroad. He was also the official successor of the Wu taijilineage. We in Europe consider ourselves blessed that a direct family member, as well as a gatekeeper from one of the most influential taiji families, settled over here. In 1986 Ma Jiangbao and his father Ma Yueliang were invited by Tommy, as he was known here, to come to Europe. Tommy, a Chinese student of Ma Yueliang who lived in Düsseldorf (DE), was a Chinese physician and bookstore owner. I met the both of them for the first time at the Tropenmuseum in Amsterdam in 1986. At that time so- called China-days were organized in conclusion of the beginners-course Chinese language “Ni hao” asbroadcasted on the Dutch television by TELEAC (an educational broadcasting studio). I had some years training in taiji as it was practiced in those days. The little information that came to Europe was practiced and shared by everyone interested for as far as it was understood. In actuality, nobody really understood what they were doing. Most information that came to us through Taiwan and later New York was passed on after a short 3 week course, but nobody had answers to the unavoidable questions that arose. When asked, your teacher would ask his teacher for an answer and he would then ask his teacher in turn and so on. When finally an answer came from the highest echelon it would be that the“professor”[Zheng Manqing] had always done it that way. Nobody would know why, not even his “master”students. From the first moment I saw father and son do their thing I knew I witnessed thereal stuff and immediately knew what it was I wanted to learn. Soon after I learned that both of them were staying in Düsseldorf and that Ma Jiangbao was also teaching over there. His father, 86 at the time, went back to China leaving his son behind to teach Wu style taiji. I visited him and asked if it was possible to be taught. His answer was: Yes! And since then I was taught by Ma Jiangbao, at first in weekly lessons, but later on also privately. In the first two years of his stay in Europe, master Ma Jiangbao was living in Dusseldorf, but after his visa expired, it was expected that he would return to China. He suddenly disappeared and we all thought he went back to his native country, leaving behind us students, a mixed group of German and Dutch people. Anyway, ever since Amsterdam and the contacts with the Chinese community that arose from that, it was made possible for Ma Jiangbao to come to Holland, to stay and teach in Rotterdam. The Chinese community first took care of his visa for 4 years and later he got married and he eventually also got his Dutch passport. Through my contacts I soon discovered that master Ma was living in Holland and I got hold on his whereabouts. He was staying at the Ocean Paradise, a floating Chinese restaurant / hotel at the base of the Euromast in Rotterdam. This place also housed a wushuschool, where Master Ma was invited to teach the Chinese and their children. teachings. At the time he could not cross the border because of his visa, which meant that the German students had to come to Venlo. A number of years later, when the borders opened up and he had his passport there were some German students that took it upon themselves to organize lessons and seminars over in Düsseldorf, thus expanding the range of his teachings to Germany. Particularly Martin Bödicker and his student and future wife Freya have to be credited for this. This way startedfrom Venlo the spreading of Ma’s Tai Ji through Europa. In these early days the EWTC, theEuropean Association for Traditional Wu Tai Chi Chuan was also founded. Many practitioners became a member. Later, the EWTC also organized teacher examinations, in which master Ma tested the candidates personally. From the beginning master Ma Jiangbao and his parents where honorary members of the EWTC. All members of the EWTC, especially the teachers, learnt his taiji. We consider him the only true source. Highlights of that blooming period were the Whitsun-seminars in Venlo, the taiji manifestations at the“Museum Insel” in Hombroich and the practice-vacations in Casimierz (Poland). A unmistakable turning point in the development of Wu taiji in Europa from 1986 onward was the decision of some members to leave the democratically organized EWTC to establish a commercially based school. They wanted to make professional business out of taiji. To make this work they felt they needed an organization in which they would have to answer to nobody except maybe to master Ma himself. Something that did not fit in well with the EWTC due to its democratic organization and familiar character. As a result the EWTC lost a number of members, but enough people remained to go on and spread Wu taiji within Europe. Nowadays growing centers of development are Holland, Germany (Koln and Bodensee), Austria, Spain, Italy, France and Rumania. Unfortunately this split still exists. However, we whole heartedly hope that the death of master Ma Jiangbao has a unifying effect on all that practice his taiji and want to safeguard his legacy for future generations. 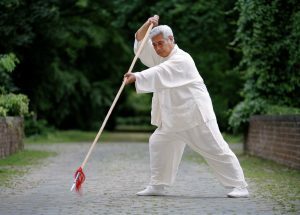 Master Ma Jiangbao didn’t only practice taiji, he embodied the extraordinary and genuine tradition of his family. Master Ma Jiangbao was a humble person, benevolent and respectful to all. His affectionate teaching method had a way of motivating and inspiring his students. He was always patient and put up with all the questions we “long noses” posed, something that isn’t common inChina. All questions would be answered, not only the how but also the why would be addressed. His hands-on approach immediately made one aware that a movement should be executed in that manner and not in any other way. Not because he said so, but because master Ma had the ability to let taijicommunicate with you on its own merit. In this way he facilitated the experience that could further the development of his students, always accompanied by the saying: “One should know what one feels and feel what one knows!” All forms master Ma passed on can be characterized by an unprecedenteddegree of accuracy (one of the most important criteria for correct practice). It was pure, meaning full and complete up to every intricate part. Everything master Ma taught was stripped down to its bare essentials leaving no room for fancy movements. His execution and flow were peerless and breathed the beauty of silence. His approach was one of no-nonsense and stripped of any ‘cloud nine value,’something we unfortunately see in so many other modern styles. If he saw people move in thisfashion, he would always make the remark: “That’s not taiji, that’s dancing!” Not that he taught lessof that, on the contrary, but taiji was something completely different in his eyes and shouldn’t beidentified or presented as such. His level in pushing hands was unprecedented. One could never detect any form of hardness within him, nevertheless, he was able to throw you any which way he liked. It was as if he always knew your intended actions in advance and neutralized them beforehand. He loved pushing hands and I demonstrated it with him numerous times: such a pleasure and learning experience! And in retrospect I can honestly say he loved every minute pushing with his students. He thought tuishou was extremely important, because it made explicit the essentials of every movement within the form(s). To him tuishou and form were inseparable and belonged together. The one could not exist without the other and together they formed the nucleus of taiji. Another thing he thought was extremely important, and also expected, was that every student tried to become a better person. Unfortunately he had no children of his own. It is probably for this reason that people who became close with him, had the feeling to be his children, especially the so called Tudis, the circle nearest to him. This schooling is a task he gave me when he began to feel unable to continue this job himself. So, the EWTC will not disassociate itself from additional information or knowledge concerning Wu taiji, assuming that the legacy of master Ma will not be watered down in practice ortransmission. Besides, it is master Ma’s legacy that certified teachers are supposed to practice, developthemselves further, and transmit their knowledge. We sincerely hope that all who practice master Ma’s Wu taiji can continue to do so in unity and inhonor and memory of the man we all loved and had so dear!